While rent and housing prices can make it hard for all but the well-heeled to work or play in Whistler, up the road about 30 minutes, the village of Pemberton is fast becoming the home of choice for the more modest wage earner. That’s why The Crestline, a new development of 36 townhouse and garden apartments, has attracted a waiting list of some 350 people anticipating the July 22 sales launch, says Stephen Duke, executive vice-president of Alture Properties, the firm developing the project. In Pemberton, Duke notes, the youth factor is strong. “It’s people who work, younger working couples who have an upper limit to what they can pay,” he says. “It’s a very young community with an average age in the mid-thirties. Duke said he expects the buyers for this project will be mostly management-level couples from Whistler who want to start a family or perhaps already have children. He said some empty nesters who are getting out of older homes in the area have also expressed interest in buying. Just a half hour’s drive from Whistler Village, and about two hours from Vancouver, the village of 2,500 sits on the floor of the Pemberton Valley, which has warmer summers and cooler but drier winters than in Whistler. This is one of Alture’s “specialty developments” said Duke, noting another luxury townhome project now under construction on Cultus Lake near Chilliwack, where each home has its own boat slip. The Crestline consists of two buildings with the homes built with one, two or three levels. 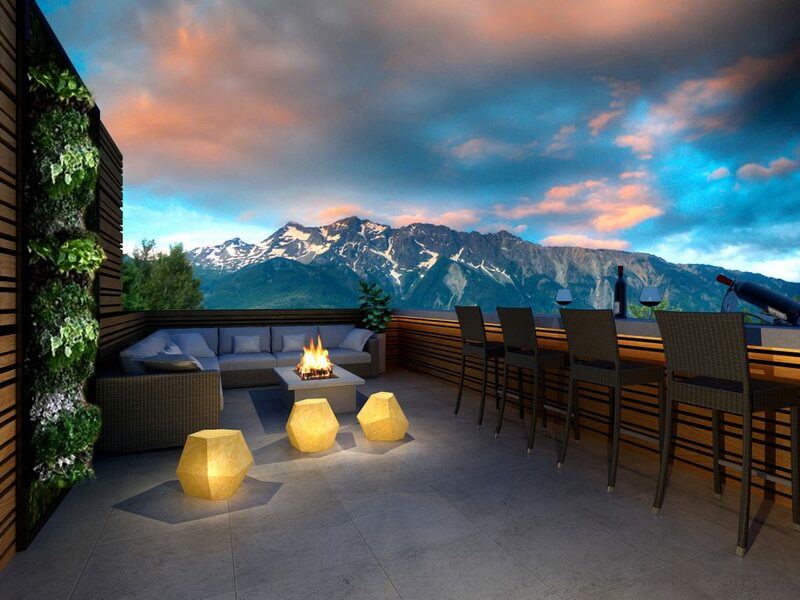 Some will have rooftop spaces providing panoramic views of Mount Currie and the Coast Range peaks encircling the area. Renderings of the project show the influence that Whistler exerts with the use of natural stone and timbers, and small dormer-like peaks and gables. “Our location is our selling feature,” says Duke, adding that it is being built for the lifestyle of people who live in and around Pemberton. The development will be located next to a new community centre, library, day care, a water and skateboard park and a planned community garden. Predictably, the underground parking has room for storing snowmobiles, which locals use to reach the Pemberton Ice Cap and Birken, which Duke says makes Pemberton one of the most popular snowboarding areas west of the Rockies. Inside the homes, all the open-living plans have nine-foot ceilings, Shaker-single panel interior doors, flat stock trim and baseboards painted white. Flooring is wide-plank wood-look V-groove engineered laminate in a smoked finish Nordic Oak. There is broadloom in all bedrooms and staircases, and large-format black porcelain tiling in the entryway. The kitchens come with a complete standard package of Blomberg appliances, including an induction range, refrigerator, dishwasher, hood fan, microwave and washer and dryer. Kitchen cabinetry is a two-tone design with wood-look flat slab doors on the base cabinets and gloss white slab doors with concealed hardware. There are quartz countertops and a porcelain backsplash. Bathrooms have modern “floating” vanities with quartz countertops and rectangular sinks, and master ensuites have spacious two-person shower stalls and a natural finish porcelain floor tile. Buyers can choose from a few upgrade options, including remote-controlled motorized roller blinds on living, dining and master bedroom windows and over-height cabinetry with flat stock moulding trim that reaches to the ceiling. Mechanical includes a heat pump combination that provides both heating and cooling, with a central hot water system. They’re not the only ones to be smitten by Pemberton. Cailey’s mother and father, who live in Spain, fell in love with the area visiting Cailey and her brother. They now dream of retiring there, Cailey said, and have plans to help her and Alex buy a home at Crestline. Duke said Cailey’s mother Linda has been calling him every month over the last year, asking when sales would begin.